Watch a quick video from Bryan Linden showing his favorite way to print. Ron Martinsen is an internationally renowned commercial photographer who has educated over 800,000 visitors on his popular Photography and Photoshop blog (http://ronmartblog.com). His printing series last year was a huge hit, but there was so much great information to share that his loyal readers asked for a book. 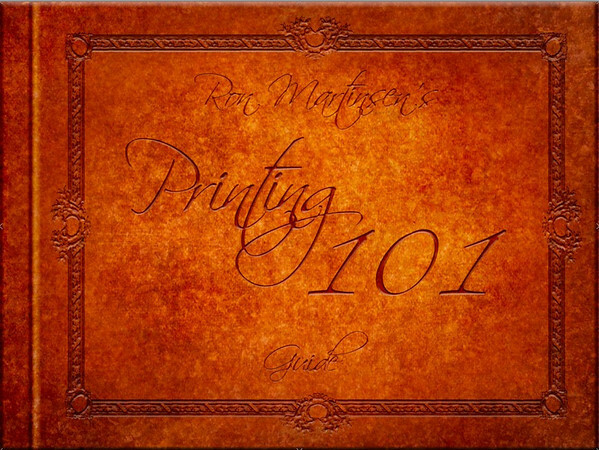 Printing 101 Notebook: An Introduction to Fine Art Photography Printing is an eBook designed to help frustrated ink jet printer users get the most out of their investment by educating them on everything they will need to make great prints. With interviews and advice from industry legends like Vincent Versace, Eddie Tapp, Greg Gorman, John Paul Caponigro, Douglas Dubler and more, this is a must have for anyone who is serious about making great prints. This gorgeous looking eBook is over 90 pages that are easily readable on your Computer, iPad, Kindle, or any other device capable of reading PDF files. It’s a scary world for an inkjet print, full of ultraviolet radiation, condensation, oxidation… not to mention the sticky fingers of 6-year-olds. And though locking your prints away in a dark, vacuum sealed chamber might be tempting, there are methods to protect your beloved prints that don’t involve hiding them from the world. But, can you both protect and display your work without compromising its unique look and feel? The answer is yes… if you take care to choose a method that enhances (or at least doesn’t detract from) the characteristics of the print. For example, do you use a matte or glossy paper? That’s important, as most strategies for protecting a print are going to affect its reflective characteristics. So you’ll need to be sure to use the right coating for the job. While the added shininess of a glossy coating may not be noticeable on a high-gloss paper, it can make a major difference in the appearance of a matte or semi-matte one. And vice versa–a matte fixative can dull the shine right off of a glossy print. Change in reflectivity is just one of many potential downfalls you may run into when adding a layer of protection to your output. Texture may be reduced or eliminated by the addition of a sealant. And other unique characteristics, like the ultra-contrast of metallic papers or the silver gelatin look of some fiber papers may take a hit as well. In almost all cases there will be some impact on the perceived color vibrancy and density of the print due to the above mentioned change in reflectivity or because of a tint inherent in the coating. You may find you like the change–many do. Blacks can look blacker, contrasts more deep, colors more vibrant–but its important that you are aware that these “enhancements” will occur. But wait, there’s more! Some liquid sealants may dampen the paper enough to cause it to visibly warp. And it’s not unheard of for coatings to yellow or crack over time. In fact, while many coatings claim to extend the longevity of the print, keep in mind that often these are just claims with not much in the way of empirical data to back them up. Oh, and some sealants stink. Literally. Its important to apply them in a well ventilated room and give the print plenty of time to air out. Even then, some people have complained about a chemical smell permanently infusing their prints after coating. Last but not least–a seemingly dry print must be given at least several days or even weeks before sealing or framing to “out gas”. Sealing or framing the print prematurely is a sure way to do the opposite of protecting it as trapped moisture and harmful gases cause it to fade, yellow or warp. With all of these factors to consider you may well decide not to take additional steps to protect your prints. After all–today’s pigment inks (such as those used by Epson Stylus printers) are water resistant and fade resistant–in a “normal” indoors environment they can be expected to last without extensive fading for 80 years or more–at least that’s what the simulations tell us (No inkjet prints are that old yet). And that may be true. However, if your prints will be outdoors (or close enough to a door or window to receive weather effects), in direct sunlight or exposed to physical handling then the advantages of some form of coating may outweigh the pitfalls. With a little research, depending on the method of protection, you can make your print significantly more waterproof, UV proof…even 6 year old finger proof. Even if protection or extending the life of your print into the next century isn’t a concern for you, there is one more thing to consider: Pretty much any coating will reduce or eliminate gloss differential and bronzing. Gloss differential is what happens when there’s a clear difference between the “inked” area of a print and the areas that received no ink. Viewed at an angle, you’ll see the inked areas have a different reflective quality while the non-inked areas of a print show a different glossiness. Bronzing is a phenomenon in which the light reflective characteristics of the inks cause a golden “oil on water” sheen to the print when looked at an angle. Both these phenomenon are tamed with virtually any kind of protective coating as they will even out the reflective characteristics of the print. It might seem overly obvious, but framing a print behind glass (or clear plastic) is a simple and effective method of offering protection to your prints. Framing protects from sunlight (if you use UV filtering glass) and, though not airtight, it does offer some measure of protection from environmental dangers like moisture and oxidation. Viewed strictly for its protective characteristics alone, though, it is usually the most expensive option, and though a nice frame will often enhance the print when displayed it will also add greatly to the storage requirements when it isn’t hanging on a wall. There’s a dizzying range of methods and terms used in this category (fixative, shellac, lacquer, varnish, clear coat, acrylic coat, sealant, UV spray and “liquid laminates” to name a few) but all share the basic idea of a liquid applied to the surface of the print via brush, roller, aerosol spray can or spray gun that will dry to some kind of protective barrier. While there are lots of liquid coatings specially formulated for inkjet output, many have also reported good results with more traditional products like those typically used for arts and crafts or woodworking applications. In fact, if you’ve ever read internet forums devoted to inkjet printing you know that experimentation is quite common when it comes to finding the perfect coating—pretty much any thing that can be sprayed on to a print has been… though not always with the intended results. For applying a liquid coating, rolling and brushing are typically the most cost effective–especially when working with larger prints. Achieving an even coat is easy with a little practice but care must always be taken to avoid brush marks and air bubbles. Aerosol spraying may be a more convenient option for smaller prints but more product may be required to achieve the same coverage as brushing/rolling. And spraying requires more care in maintaining proper ventilation in your work area. An HVLP (high-volume, low pressure) spray gun is perhaps the best, but most expensive, method for higher volume applications as it provides efficient, even coverage on large and small prints with very little waste. Most liquid coatings will be water, solvent or oil based. Water based coatings can cause smearing on non-water resistant inks and some solvents may react badly with some paper coatings, so be careful. A test application is always recommended. Lacquers and Varnishes are perhaps the two terms you’ll see most often in this category. Lacquers tend to be thinner and faster drying then varnishes, but are more flammable so proper precautions must be taken when applying. Lacquers are solvent or water based, Varnishes are oil and resin. In lamination a clear plastic sheet is fixed to the print with an adhesive. The normal lamination process uses heat to activate the adhesive and create the bond between a top and bottom laminate, with the print “pouched” between. But the high temperatures needed may in some cases harm the print. That’s why “cold lamination” is often used for inkjet output. In cold lamination, the print along with an adhesive backed plastic sheet are fed between two rollers which apply pressure to the two, sealing just the face of the print and the single laminate sheet together. There are a variety of both hot and cold laminators (priced anywhere from the low hundreds to high thousands) suitable for inkjet prints. (Remember when pricing a laminator that the laminate material itself is a factor–some can, inch for inch, rival the cost of the paper). Lamination has the advantage of ease of application and durability. Laminating gives a more “plastic” feel to the print however, and may not be desirable for fine art prints. Unlike liquid coatings, off-size prints will need to be trimmed of excess material once laminated. At this point it’s probably a good idea to put in a quick word about printer profiles and paper coatings. Since paper profiles are in almost all cases NOT made on papers with protective coatings applied, if the protection you choose does change the tint or density of your prints in a significant manner it can be tricky to compensate for the change when creating or editing your images. One workaround is to simply create a soft proof of the coating’s effects in Photoshop via an adjustment layer. The basics are: First, make sure you are getting a good screen to print match without the coating applied (using your printer/paper profile via the normal View-Proof Setup methods within Photoshop). 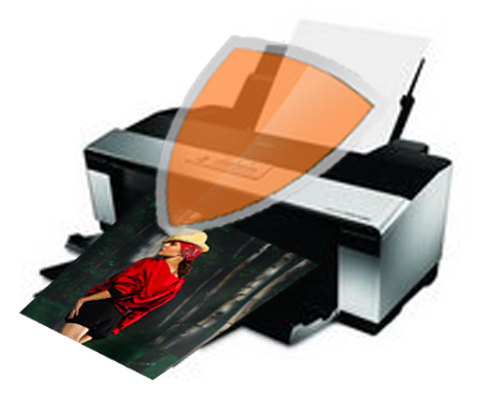 Now, coat the print, let it dry, and hold it next to the computer screen while Photoshop displays the same image as a soft proof. Create an adjustment layer in Photoshop and use its controls to match the tint or density. Now, when you are correcting images that you will be printing and coating, you can activate the adjustment layer to see how the coating will affect it. Make sure not to save the adjustment layer with the image – the adjustment layer is just for seeing the change the coating will make so you can correct for it! To close off, here’s a very brief and very far from comprehensive list of liquid coating products that you might see out there. Remember–ColorByte is not in the business of print protection and we aren’t recommending any of these. We’re just listing some well known popular names of coating products you may want to put into Google as a jumping off point in your search for that perfect print protection. Know of something not mentioned here? Let us know in comments! Well, that’s it for this overview. Whether you decide to armor your inkjet output against the elements or let them meet the world au natural we hope this has been an informative look into the available options you have when it’s time to expose your precious prints to the cold, hard world. There is an exciting new paper arriving soon from Innova. The official name is Innova FibaPrint Warm Cotton Gloss. The market announcement will come at this years WPPI convention in Las Vegas. US shipment should begin the week of February 20th. FibaPrint Warm Cotton Gloss is a 100% cotton paper. It contains no optical Brighteners (OBA) in the base or in the papers coatings. It has a total weight of 335 gsm (grams per square meter) which will give the paper a substantial feel without being too stiff. Here is what Fine Art Photographer Pete Myers has to say about this new paper. The base has been made as smooth as possible and the ink receptive layer is Innova’s latest generation technology. US Roll sizes will be 17”, 24”, 36”, 44” and 60”. Cut sheet sizes will be available in 8.5 x 11, 11 x 17, 13 x 19, and 17 x 22. David Williams at Innova has been kind enough to offer to send our customers a sample of this new paper once it’s available. If you are interested please email David at: davidw@innovaart.com. 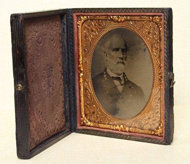 I recently heard about an old photograph of General Robert E. Lee that sold at an auction not long ago for $23,000. The photo ended up at Goodwill in a box with other things that are sold by the pound. By chance a Goodwill worker came across it and recognized the subject. Since Lee lived in the 19th century and not too many photographs existed at the time, the worker thought it might be valuable. And he was right. The photo fetched $23,000 on the Goodwill auction site. In this day of digital photography with CDs, DVDs and hard drives loaded with image files, that got me to thinking, just what is it that gives an image (or any art for that matter) its value? And I’m not just talking about monetary value, but emotional value as well–the kind of value that can reach across time. To the artist that creates the work, value may seem an abstract thing, something that’s inherent in the work regardless of its final form. But to anyone else the media matters. It might be a piece of film, a computer screen or an inkjet print, but whatever “delivery method” is used for the art will have an undeniable effect on its value. Which leads (as often seems to be the case on this blog) to the subject of inkjet printing. Specifically, how printing should not be considered a separate procedure to be done once the “art part” is finished, but rather it should be seen as an integral part of the creative process itself. Editing, cropping, picking just the right paper–all have consequences. All enhance, or detract from the final work. All affect its “value”. Admittedly, not all images (even very good ones) are suited for printed output. Yet all too often for those that are that final step of rendering the image to paper, of “finishing it”, is never taken. It wasn’t always that way. In fact, not too long ago creating a physical print was absolutely necessary in order to see the fruits of your photographic work. But it’s all too easy these days to leave even your very best images in a kind of limbo on your hard drive. After all, you can view it on screen — isn’t that enough? Not for me. Until I’ve put that great image on just the right paper–until I’ve created something I can hold or hang, something I can pass to others, something that will last–it just doesn’t feel complete. It hasn’t achieved its full value. Of course, printed images take up a bit more space than they do on a hard drive, and while it would be nice if we all had endless locations to display them if you’re like me you ran out of wall space a long time ago. That’s why I feel that proper storage is imperative for any serious photographer. And by proper storage, I don’t mean big hard drives. No, a system of museum boxes and portfolios are what’s needed here, something that offer protection as well as ease-of-access to your print-worthy work. (Just remember to let those prints off-gas before putting tissue paper over them and storing them away). Storing my photographs in a organized fashion allows me to keep a rotating selection of prints around as conversation pieces (and if I get really energetic I might even make a coffee table book–which is a whole topic on its own and one possibly worth exploring later.) But the point is, I make sure I have safe, convenient, logical storage for my prints. Who knows? I could be wrong about the value of always printing your best work. Maybe years from now some raw file or jpeg of mine will be discovered in a box of sd cards (if old enough hardware to access them can be located) and some shot I made may transcend time to touch someone–or make them a lot of money. 🙂 But I highly doubt it. For my money–it’s the images I’ve freed from the computer drive and shared with the world that have the real chance to stand the test of time. It’s those finished work, my prints, that really show their full value. In today’s post, ImagePrint Today tackles the subject of the platen gap. Though often ignored or misunderstood, this setting can be a key factor in achieving sharp, problem free prints. So.. just what is the platen gap, anyway? The platen gap is simply the distance between the print head and the surface of the paper as it passes through the printer. As papers of different thicknesses are loaded, this distance will necessarily become either larger (with thinner papers) or smaller (with thicker papers).